Christy transports us back to 1968 with her beautifully illustrated children’s book (written by James Gladstone) about the Apollo 8’s mission to the moon. Below she talks about process, collaboration, and her overall experience working on her first children’s book. Over the past four years, you have been creating illustrations for a variety of clients, including work for magazine and book covers. 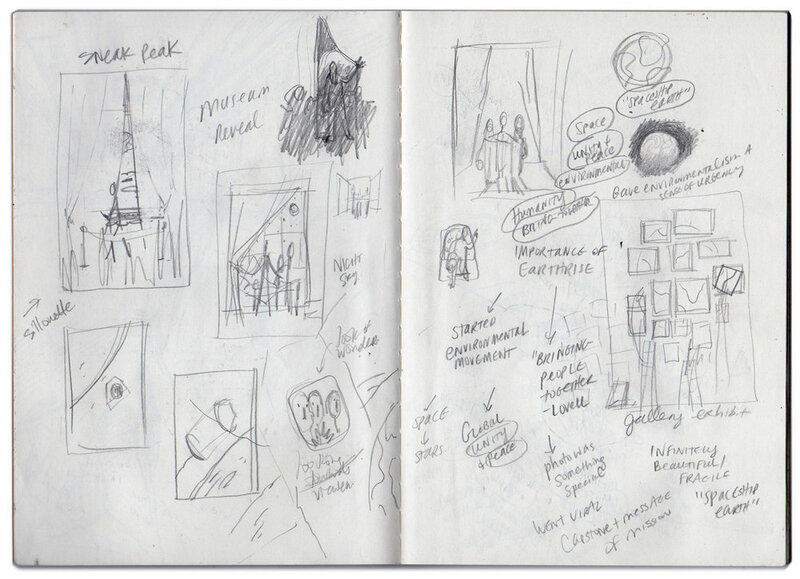 Illustrating a whole book, however, is a dream job that may never come to fruition for many illustrators. This being your first illustrated children’s book, can you tell us how this project came about? As with many of the other jobs that have come my way, this project came as a result of past work, good timing, and a client's trust. Karen Li, editorial director at Owl Kids had acquired a manuscript for a non-fiction about the Apollo 8 mission, and (conveniently for me) had seen a recent Quill and Quire cover I had done. The cover had a night sky with stars and a moon in it, illustrated in a fairly retro style. She thought my work might be a good fit for the story, so she reached out to see if I was interested. I felt a connection to the story's deeper meaning, and since my work is partly inspired by the era and setting of the story I felt like it was a good fit for me too. ﻿Working with non-fictional content comes with its challenges. What role did research play in your process? Before I touched pencil to paper I had a lot of research to do. I didn't know much about the Apollo 8 mission, and I quickly found that I didn't know much about America in 1968 either. I knew about the 1960's and 1970's as a whole, but a ton of crazy stuff happened there in 1968! I also had a chat with my dad, as he was in Virginia that same year and could give me a bit more perspective on the political unrest. Then I spent a lot of time digging up visuals from that time - I found advertising illustrations, silkscreen posters, decorating patterns, photography, postage stamps and space race propaganda. This research helped me develop the retro feel Earthrise has. A limited colour palette, warm yellow pages and plenty of negative space within the compositions inspired by these references helped to push the style of the book, which I hope will transport readers to the late 1960's. Your illustrations in this book integrate beautifully with the type. Can you talk a little bit about the collaborative process of working with a designer, author, and publisher? 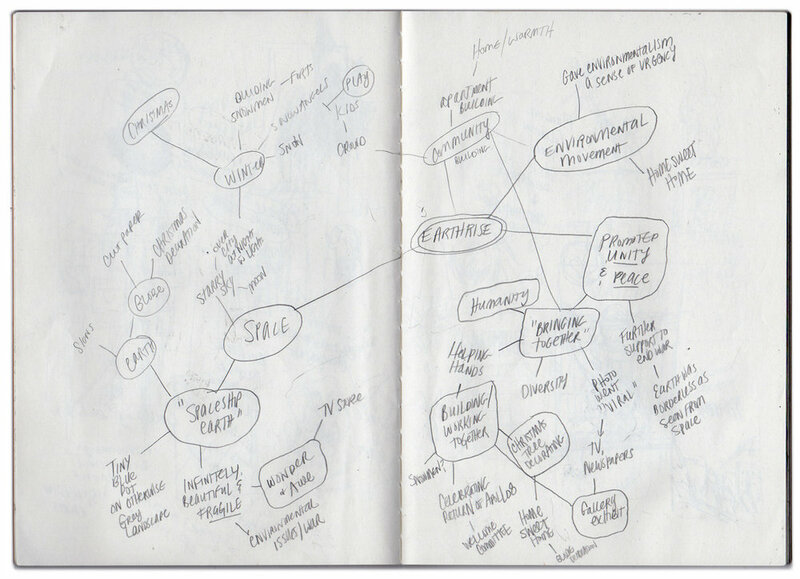 James Gladstone (author) and Karen provided me with a paginated manuscript right at the start of the project, so I was able to conceptualize the story by splitting it into segments. James' writing flows beautifully and lends itself easily to imagery, so it made coming up with ideas feel natural. Thankfully Jill Dallas' design class helped prepare me to thoughtfully lay out a book's illustrations, by leaving room for type. So from my very first set of thumbnails I indicated where I wanted the text to go, and then Alisa Baldwin (designer) laid out the type and brought everything together beautifully. She would tell me when elements needed to shift, so there was some back and forth there. She and I also did some trouble shooting for the text that couldn't be black (you know...a bit of a problem with a book about space). There are a few spreads where the text is knocked out from the black plate, and we had to figure out how to set up a photoshop file so that the text would come out looking cream - a big learning curve for me. Throughout this process I worked very closely with Karen and Alisa. I didn't work directly with James, but his feedback came with Karen's and if he had a specific request for a change (usually to do with historical accuracy) Karen and I would chat about it. I'm really happy with the work the four of us did - this was truly a collaborative process. Of course, learning continues well beyond our years in school. Was there anything in particular that you learned from this project that has impacted you or your work? This project was particularly challenging for me because it was made in a very short amount of time - around 8 or 9 months I believe. Most children's books take at least a year, but the 50th anniversary of the Apollo 8 mission was on the horizon so we had to move fast. Paradoxically, it was also a challenge for me because it was a project with a long timeline. I was used to quick assignments - the longest being 2 months up to this point. I needed to approach this project differently because of that. My artistic voice was (and is) still developing, so while making the finals I would work on many at the same time, switching back and forth. Then I went back to all of them at the end for finishing touches, so that the book would feel like a cohesive body of work. This experience has helped me to work more quickly when I have tight deadlines, and has helped inform my approach to creating a body of work. I think that awareness of seeing a project or series as a whole package will lend itself well to future opportunities, such as developing a brand. Being your first children’s book, this must have been an exciting project for you. What is your absolute favourite part of this whole experience? I loved getting to compose and paint the double-page spreads with the spacecraft - playing around with the space and the lighting to make it more dramatic. That was one of my favourite parts of the whole project. And lately I've really enjoyed seeing the book get some attention. Most of the time when I put an illustration out in the world I don't get to hear how it's received, but with this book I have! There have been some nice features and reviews on the book, and many people have reflected on it's peaceful and environmental message. 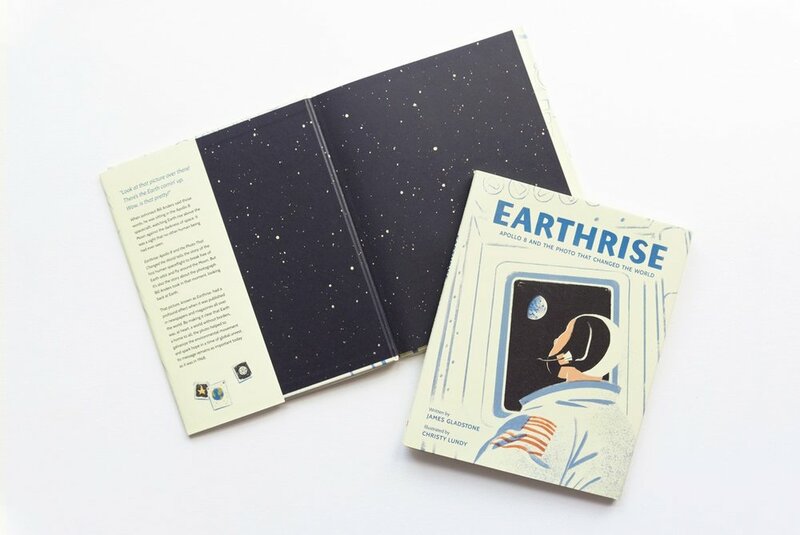 I even got an encouraging email the other day from a mom, who borrowed Earthrise from the library for her two aspiring astronauts! That's been an unexpected and delightful part of this experience. Thank you so much for taking the time to talk to us about this project. It was a pleasure to spend some time with your work and to read more about your process. Do you have any closing thoughts about this project or any advice that you’d like to share with current students, or recent alumni? My pleasure - thanks for being interested in and sharing Earthrise! I'm happy to have the chance to chat about it. I would like to encourage students and recent alumni to keep making work, even if you think it's not making any difference or being seen. Creating is such a solitary endeavour most of the time, and it's easy to be hard on yourself. But you never know where your work will take you! Be open to new experiences and say yes to opportunities you want to take, even if you have doubts about your abilities - because you can learn on the go and sometimes a little extra pressure is a very good thing. Christy is a 2015 graduate of the program. You can view more of her work at christylundy.com. All images provided by Christy Lundy.